Scaling the heights of healthcare with blindness prevention charity Orbis’s Flying Eye Hospital. Nurses who work aboard a charity’s flying eye hospital have spoken of their passion for helping children and adults in developing countries to avoid blindness. Ann-Marie Ablett helps to train nurses on board. The Orbis Flying Eye Hospital, an MD-10 jumbo jet, landed at Stansted Airport this week as part of a campaign to promote better healthcare in developing countries. University Hospital of Wales band 7 clinical leader in eye theatre Ann-Marie Ablett first volunteered with blindness prevention charity Orbis 15 years ago. Despite a fear of flying, Ms Ablett uses four of her six weeks of annual leave to jet around the globe with Orbis helping to train nurses and care for patients. ‘Nurses are nurses the world over – we just want to care for the patients,’ she said. ‘I hate flying, it frightens the life out of me and I pray all the way there, but I wouldn’t let that stop me. Ms Ablett helps teach nurses how to sterilise surgical instruments, use ophthalmic tools, scrub correctly and prevent infections. The aircraft provides on-board surgery and is set up as an ophthalmic teaching hospital – complete with a 46-seat classroom, cameras and live streaming. 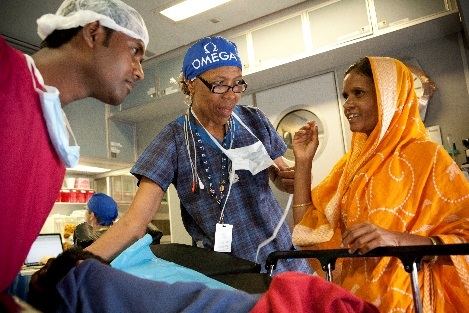 Medical teams aboard the hospital carry out sight-saving operations, including cataract and laser surgery, in 18 countries across Africa, Asia and South America. 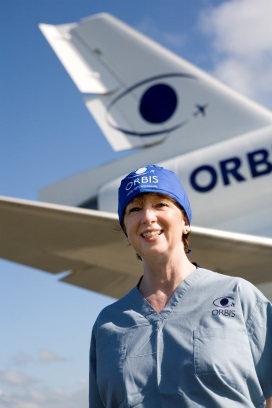 Flying Hospital head nurse Angela Purcell was a band 7 ophthalmic specialist nurse at Moorfields Eye Hospital NHS Foundation Trust before joining Orbis in 2013. She manages five full-time nurses, works on board the hospital wherever it travels, and helps supervise other hospital-based health programmes. Ms Purcell said delivering patient care and staff training in developing countries was highly rewarding. ‘It is often emotional when you take an eye patch off, it might be the first time a child has walked towards his parents unaided, or the first time an adult sees light. Orbis’s Operation Sight campaign aims to raise enough money to provide 100,000 training sessions and improve facilities at 30 hospitals in Africa and Asia. This year the plane is due to visit Vietnam, Cambodia and Bangladesh.